Guess where I was Thursday morning. You’ll never guess. Do you give up? Okay I’ll tell you: I spent the morning with my friend Jenny Avon (the founder of Thames Ditton Crafters) at Homemade London attending a Hobbycraft Press Show Day! A whole morning spent doing crafty things, talking about craft, easter craft hunting and uhm… cough, cough… meeting being in the same room as Kirstie Allsopp! 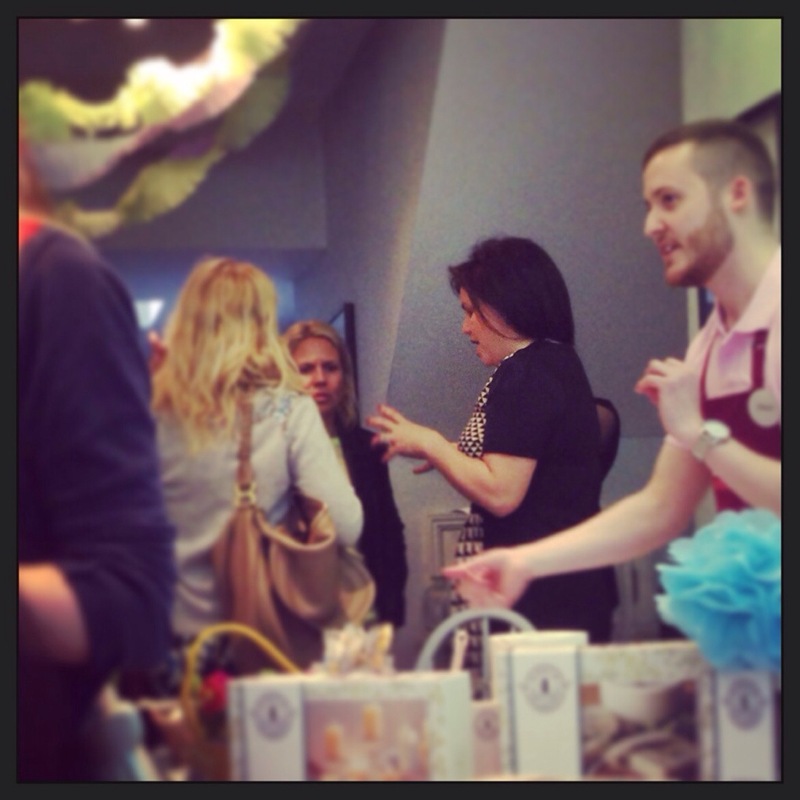 She of Homemade Home and Handmade Britain! I had the Thursday Morning Of My Dreams. Jenny and I met at the station and made our way by train and bus (thankfully the tube strikes were called off!) 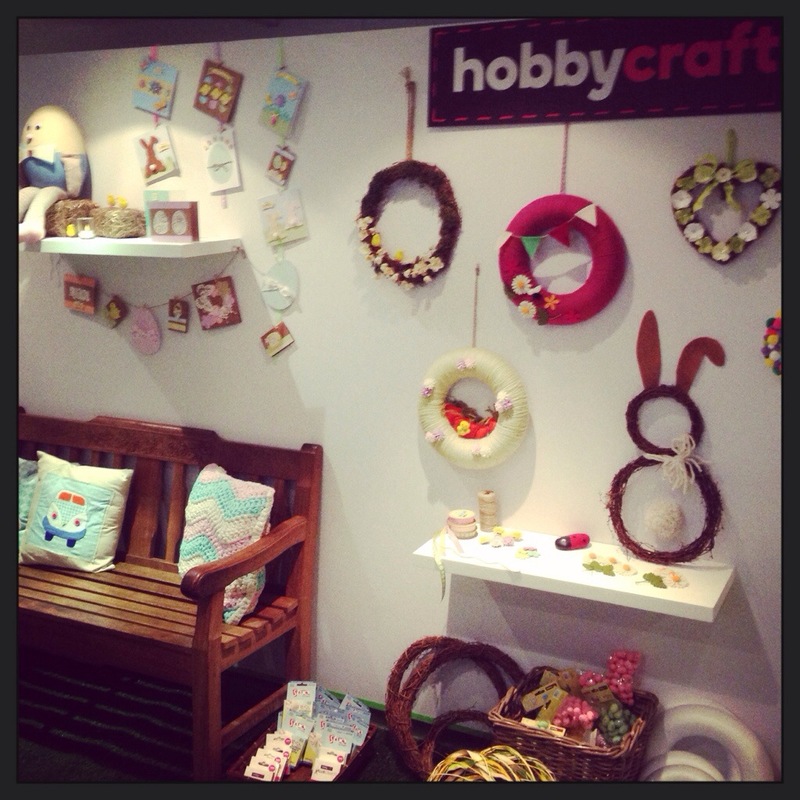 to Homemade London’s craft salon near Marble Arch. It was our first time there and I have to say I feel like a prize idiot for not having known about this little jewel of craftiness right here in London. It’s a fantastic place. You can host hen parties, birthdays and team building events there or attend any one of their fantastic workshops. They offer around 20 types of workshops which include candle making, perfume making, learing to sew with a sewing machine, embroidery, wedding craft and even a mystery workshop. This is how close I came to Kirstie. So close yet so far. She is even prettier in real life I tell you! 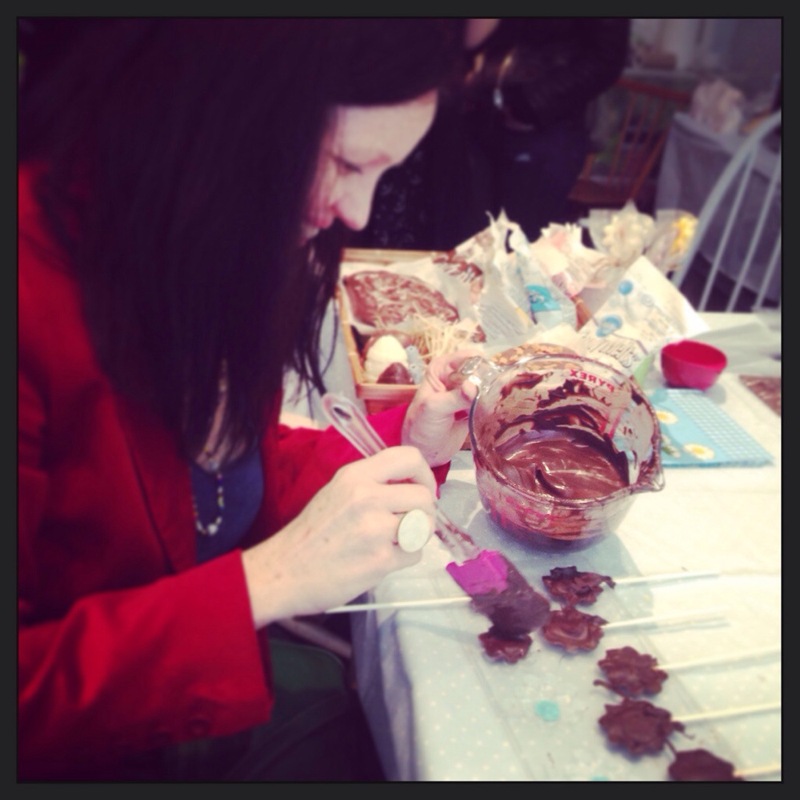 The press show day was mainly to show us Hobbycraft’s great range of Easter items and introduce Kirstie Allsopp’s craft kits. On ground floor level we had the opportunity to try our hand at some crafts. I attempted to paint a glass jar with glitter, Jenny made a tissue paper pompom and we both made chocolate lollipops expertly taught by the Hobbycraft crafters. The whole lower ground floor of Homemade London was turned into an Easter Bunny Grotto where we could “hunt” for easter goodies and learn more about Hobbycraft’s Easter range. Crochet was represented by Boodles t-shirt yarn. With Boodles you can whip up a handbag, hot water bottle cover or cushion in minutes. 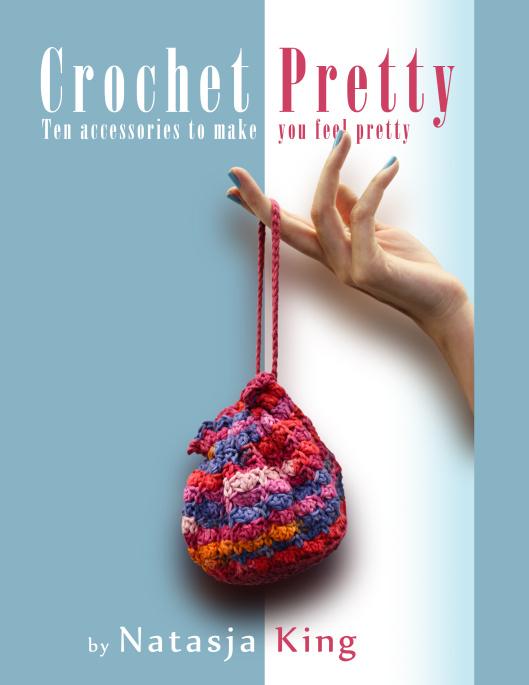 Boodles yarn is included in the 3 for 2 yarn offer and Hobbycraft offer free patterns for an iPad cover, pouffe and round place mat on their website. I had a very successful hunt, coming away with the makings of an Easter wreath: natural rattan wreath, wooden flower decorations, and glue dots. The small decorations all fitted into a pretty yellow easter felt basket which I had to carry in my hand on Oxford Street and in the tube. You can just imagine how proudly I swung my little yellow basket and wreath. Speaking of baskets. Did you that Hobbycraft sell hamper making kits? It’s been a great seller for them and I can see why. The picnic hamper is around £10 and for another £10 you can buy everything else you need make a personalised gift hamper. It’s ideal for Mothers Day, Get Well Soon gifts and of course for birthdays. Cake decorating has also never been this easy. With Renshaw Deco Icing anyone can decorate a cake to look like a Mary Berry creation. If it’s not the best bake it the world, no-one will care because you would have decorated it expertly with the Hobbycraft cake decorating supplies. If you know of Kirstie Allsop you would agree that it was probably only a matter of time before she, the Queen of craft, and Hobbycraft, the UK’s largest craft retailer, would join forces to create a premier range of craft kits. Kirstie’s craft kits are already available online, and will also be in all 79 Hobbycraft stores nationwide from 24 February. I was lucky enough to receive the Candle Making Kit. I’ll try it out soon and let you know how I get on – hopefully not like a house on fire. After Thursday’s experience I’m so ready for Easter. I dare you not to get excited too if you see Hobbycraft’s range for Easter. Adults and children alike will be itching to start crafting. Just in time for half term crafting with the kids, Hobbycraft is giving 20% off everything from Friday 14th February to Sunday 23rd Feb (midnight) with the code HTHC14. And if you sign up to the Hobbycraft Club this month, you’ll be entered into a draw to win this hamper of craft goodies worth ….wait for it… £400! The Hobbycraft Club gives you 15% off code for their first order, tailored emails about the crafts you love, inspirational content and craft ideas and for the month of February, also the chance to win this hamper. Just click here to go straight to the sign-up page. OH MY GERD!!!! 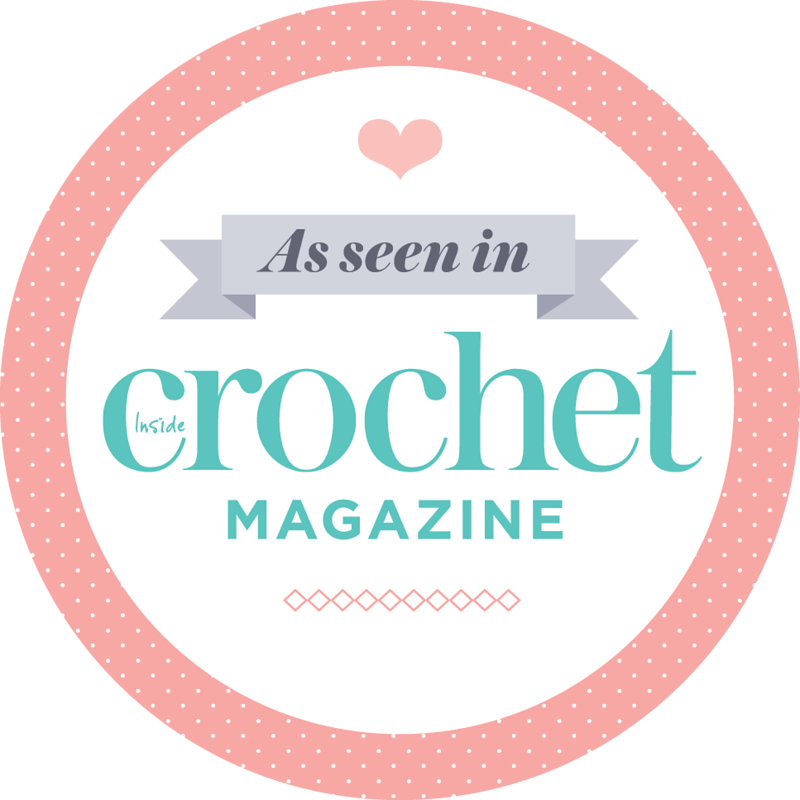 So much crafty goodness AND a code for Hobbycraft??? I bow before your amazingness. Let’s not even get into the being-in-the-same-room-as-Kirstie-Allsopp! 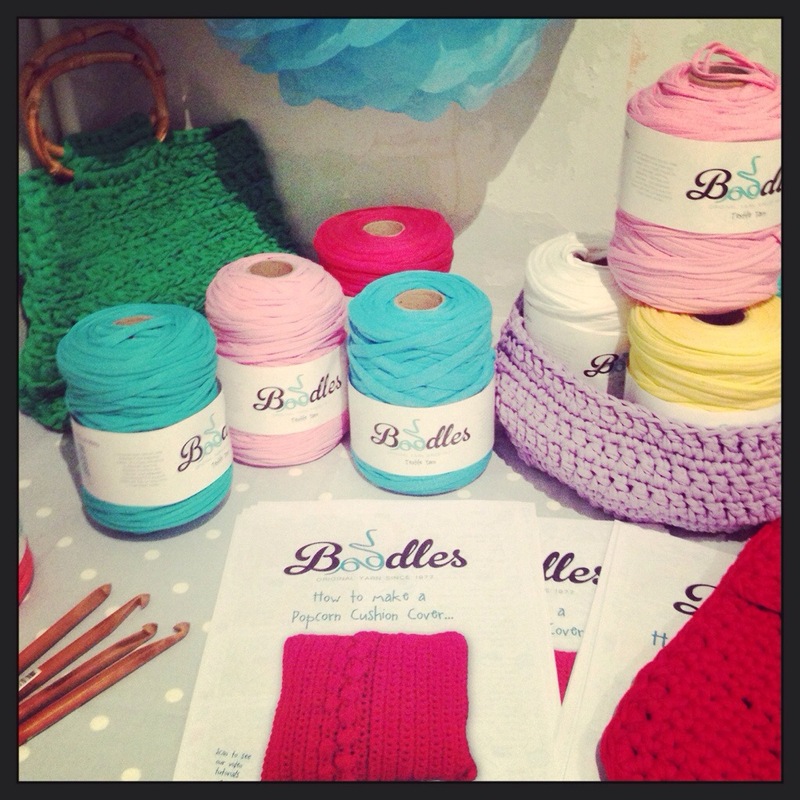 I really wanna try the Boodles yarn. Ive used the Zpagetti one but not the Boodles. 🙂 Now I want it so bad! Thanks for the yummy inspiration. Im off to check out the Easter range. :-D. I hope you found something to buy at Hobbycraft. The 20% code is great isn’t it?